The holidays are fast approaching, and I am gathering my recipes for the Thanksgiving and Christmas feasts. Thanksgiving is my holiday in the family, and for the past few years I have been introducing new ingredients and styles of cooking to the traditional family recipes. When you are a culinary school graduate you are expected to produce a fabulous spread, but with my family it needed to be fabulous, but what they were used to. Roast turkey, candied yams, macaroni and cheese (which I still make, but my version) cornbread dressing, collard greens, and sweet potato pie. My sister Laurice still does the candied yams and sweet potato pie, but the other items have slowly been tweaked by me. I began serving a lower fat roasted sweet potato, which has evolved to include other vegetables. Instead of collard greens boiled up with a ham hock, I may now serve sauteed chard or kale. When I make my dressing I use lots of chopped vegetables for flavor. These roasted vegetables can be made anytime, as they make a really nice side for just about anything. And because they are not only vegetarian, but vegan, everyone can enjoy them. 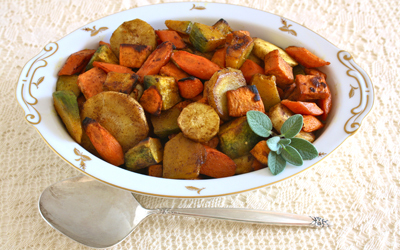 Winter root vegetables roasted with warming spices makes an excellent side dish for the holidays! This combination of flavors and spices would make anyone jump for joy over eating their veggies. They look and sound super delish. Great dish! I love the seasonings that you used, I will have to give it a try. All these winter veggies are some of my favorites to have once the colder weather comes in. These were DELICIOUS. I’ll be making them for our Thanksgiving spread! never imaginged roasting with allspice and cinnamon… great idea!!!!! Yum! 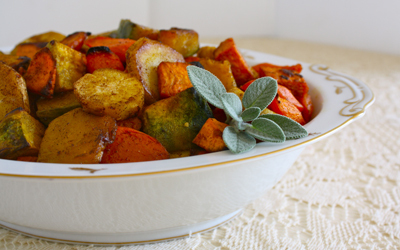 roasted veggies add a much-needed color boost to the traditional beige Turkey Day table. Yours sound delicious AND healthy. I found your site through Tori aka The Shiksa. Thought I would pop by and say hello. These veggies looks so good. One thing I love about winter is roasting vegetables. Yours are gorgeous. Hope you have a wonderful week. these were the bomb! so glad i packed up some to go… always a pleasure to dine with friend, so thankful blogging introduced us. This is an incredibly delicious recipe! So simple, and yet so flavorful. It was great meeting you and sharing a wonderful meal this week, Cheryl!